These works are scheduled to start on the 10th August 2015 and will continue for roughly 5 weeks. The hours of working will be 0745 – 1615 Monday to Friday. For the first two weeks of the scheme there will be a road closure in place along Short lane between the hours mentioned above and a short diversion route for vehicles to follow. This is to allow us to replace damaged pipes and install a new drainage system in the carriageway further away from the tree roots that are causing damage to the existing pipes. This will also mean that we will have to leave traffic management up outside the hours of working due to the excavations we are doing as part of this scheme. Once this section has been completed we will be working our way up Wood End installing new gullies on a place to place basis under traffic lights as well as replacing any damaged gullies and providing new kerbs in some areas to try to facilitate the flow of water and prevent it remaining on the surface of the carriageway. Once these works have been completed the aim is to have alleviated the drainage issues in the areas mentioned as much as possible and provide extra avenues for the water to escape off the carriageway. The newsletters are being delivered to all households at the moment, but why not have a sneaky peak. Click here to open the newsletter. 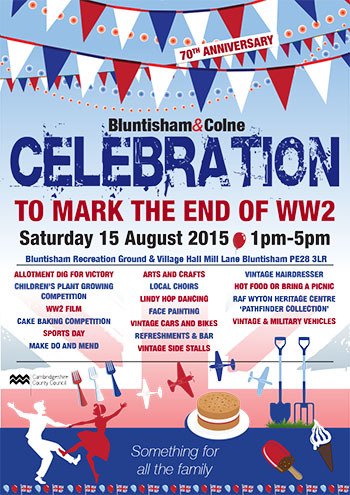 Come and join in the celebrations in this community event held at Bluntisham Village Hall and Recreation ground. If you wish to volunteer to help out on the day please contact the clerk. Got a few hours free on Saturday afternoon ? Why not pop down to the school and join in the fun activities and help raise money for FOSH. The weather is going to be hot hot hot ! 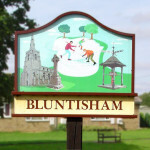 On Saturday Bluntisham residents are holding a walk-around garage sale in aid of Macmillan Cancer Support. Have a great day hunting out a bargain or two for an excellent cause ! The day was a great success, raising over £300 for Macmillan Cancer Support and the organisers hope to make it an annual event.